It was this time last week when my doctors told me that they were going to induce me on Wednesday July 25th. I really wanted a natural birth. Not to be induced, but my doctors informed me that it was safest for me and baby. So, instead of waiting for them I figured I’d try out all those thing that “make” you go into labor. I ate a few servings of pineapple, hubby took me out to eat at Hooters for hot wings, and then we walked around a 24hr Super Wal-Mart for about 2 hours since nothing else is opened after 10pm in our area. We did all those things and then Tuesday July 24th (my birthday) I woke up at around 3:45am with contractions, and even passed my mucous plug. I thought it was just pains from that, but then I couldn’t fall asleep as the pain was coming every 10-15 minutes. I finally fell back asleep at 5am, then awoke again at 7am with extreme sharp pains. I put a call into my doctors office and they said I should come in at 8:30. Sure enough when we went to the doctor’s office I was 1cm dilated and the doctor said I was in early labor. Instead of inducing on the 25th, they would be doing so now. 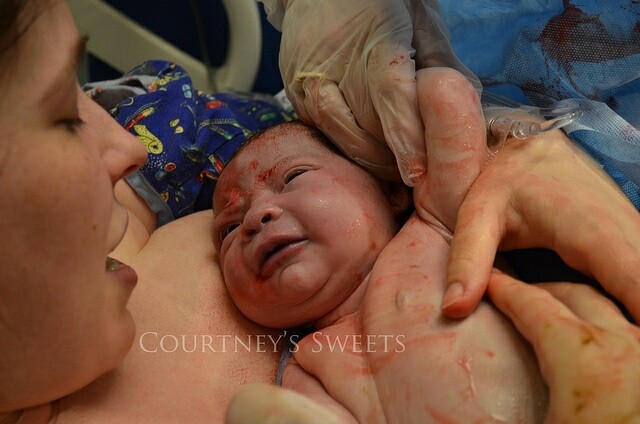 At around 9am we arrived at labor and delivery. 11:15am 2 1/2cm dilated and doctor broke my water. 11:45 They started giving me pitocin. 4:40 Now 4cm dilated and not feeling much because the epidural. 7:50 Up to 5cm dilated and getting anxious to meet Mikaylee!! 9:30 Nurse checks and I’m fully dilated! Doctor will be here by 10:30. 10:30 Time to start pushing! Epidural ran out at 10pm! Pushing, pushing, thirsty! Between each push I eat ice chips.. Begging for a glass of water. Then when they wouldn’t allow me water, the next time Chris passed me the ice chips.. I poured the entire cup all over myself.. The doctor kept telling me we see her head! Push, Courtney, Push!! I kept telling her “I can’t anymore!” .. 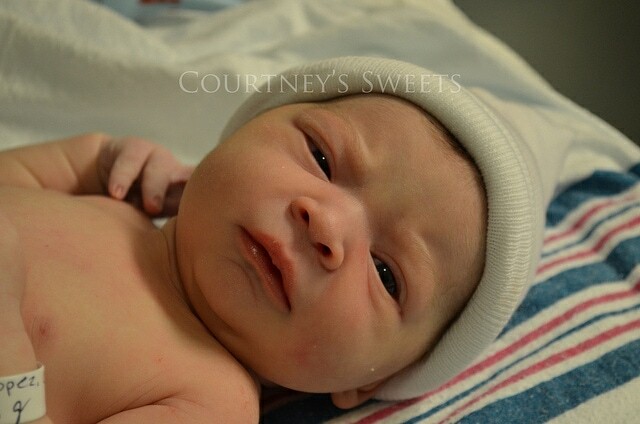 I pushed and I pushed up until 12:11am when I heard she’s here!!! I heard my Sweet Baby Mikaylee first cry. The sound of her cry brought both of us to tears. They placed her on top of me and I looked right into her eyes.. It was the most incredible feeling ever. I am so in love. I still can’t believe I gave birth to this sweet baby girl. They took blood for a PKU test and she was so upset, it hurt me to see her that way – I can’t even imagine her getting shots! I could look into her eyes for hours, and hold her forever. God really answered my prayers, and blessed me with this sweet little miracle. 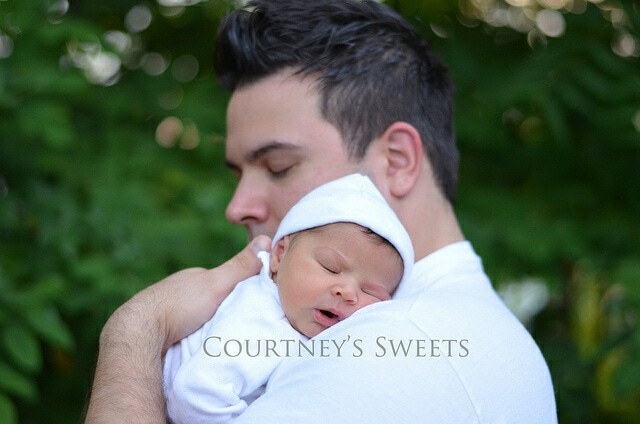 Hubby is so happy his princess is finally here. I love you Mikaylee, more than anything! 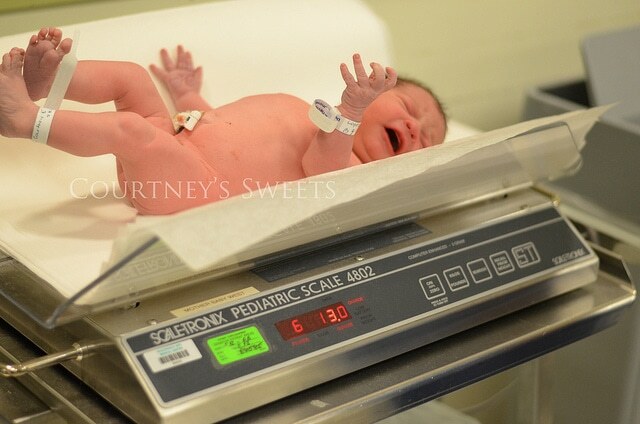 Oh my gosh, Courtney, she’s absolutely PERFECT!!!! Congratulations!!! awwww so incredibly sweet. 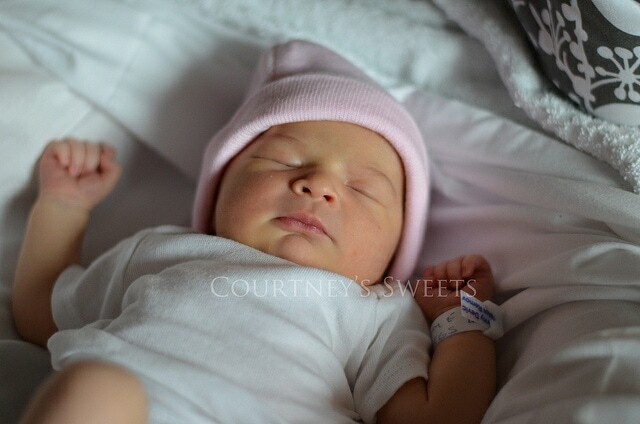 I’m so happy for you Court, she really is a beautiful little miracle. Enjoy every second with her. 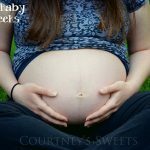 Such a beautiful birth story and photos!! Congratulations! She’s so beautiful! That picture of you first holding her totally bought back memories of holding my son for the first time- I am totally teary eyed over here. SO happy for you. What a beautiful birth story! CONGRATS!! She is stunning! AWWW she is so precious. Great photos! I remember giving up with Gavyn. I pushed for a long and hard 75 minutes. I am like Shell toally teary eyed! So thrilled for you and your husband. (PS..shots will make you bawl the first few times.) Congrats again mama! What a beautiful birth story! She is gorgeous! She is so gorgeous Courtney! I am so very happy for you and congratulations on joining Team Mommy. She is beautiful, Courtney! I’m so glad that all went well and you now have your precious Mikaylee! 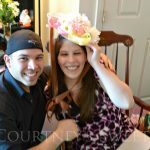 Congrats Courtney! I lovelovelove the picture where you’re looking at her on your shoulder where she’s wearing the white onesie. She is so sweet! I don’t know how I missed this! She is so beautiful. I know you are in love with her. What a precious baby. She is beautiful! Look at that gorgeous head of hair and perfect complexion! Congratulation!!! Children are a blessing. She is so pretty! Congrats on your birth and thank God all was well! I can’t wait to see more pics of her. 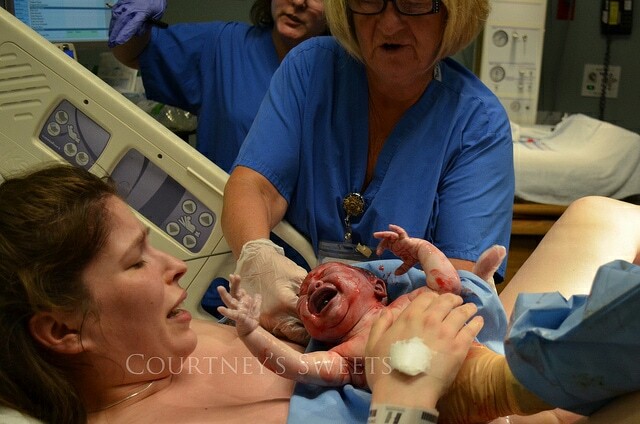 There’s just something magical about giving birth. First, there’s this excruciating pain and then as soon as you see your baby, all the pain in the world gets replaced by love and happiness. 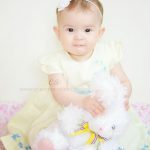 You have a very beautiful baby girl, and I just have to say, your pictures are superb too! this just brought me to tears. she is absolutely gorgeous! Congratulations, welcome to the world Mikaylee! Awww, what a wonderful birth story! That was a wonderful birth story! She’s very beautiful! Congrats, Courtney! She is gorgeous! What a beautiful story! She is so absolutely precious. You did a great job! Oh my, I cried tears of joy. What a beautiful story. Congrats! 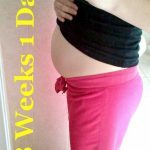 I love your birth story and you shouldn’t be sad that you got an epidural. I was waiting for this post to finally arrive. She is beautiful, and look at all that hair. Congrats to the three of you! Congrats mama!! 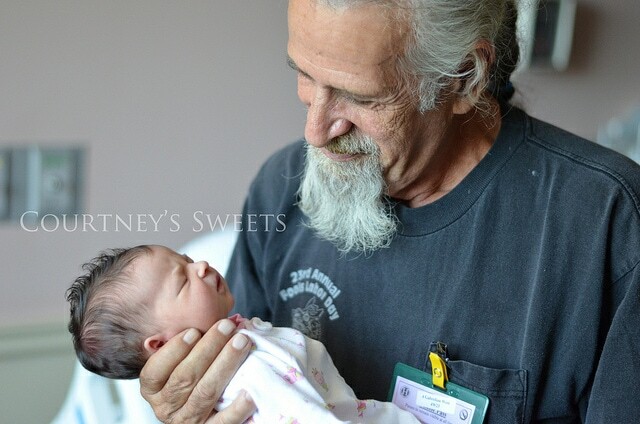 I love the picture of your grandfather holding her! What a blessing! She is just precious. Love her little dimple! The pic of her with her great-grandfather almost brought me to tears. What a sweet picture. 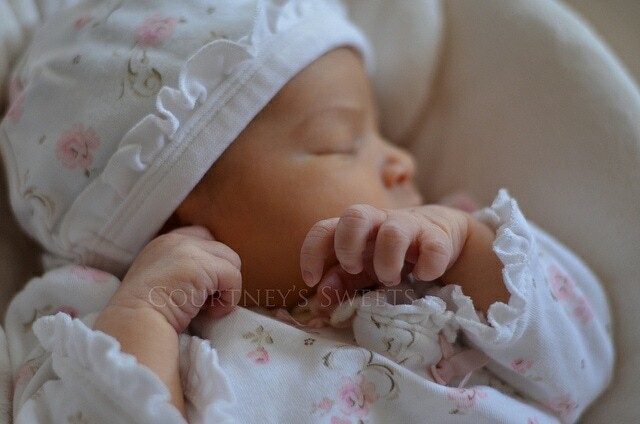 Congrats on your beautiful girl – hold her and soak up every minute of her sweetness. I cried when I read that your Grandpa got to meet her. That is so special!!! 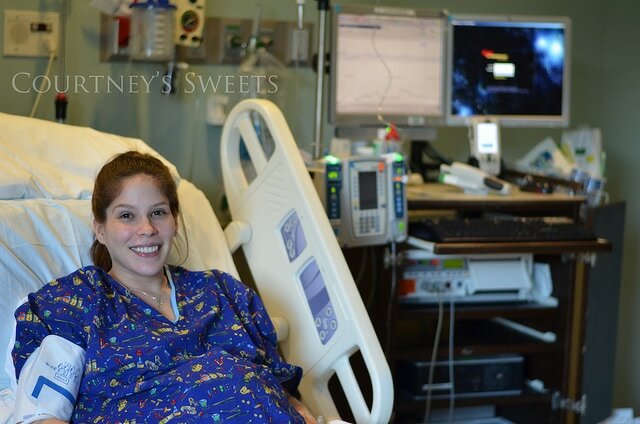 Congrats on your little miracle. Congratulations on your precious baby girl. I love the outfit you have on her in the first photo. Adorable. Such a beauty, I love the story!! So happy for you and so thrilled I got to read about her birth the months while she was growing inside you! She is so beautiful! Congrats!! THANK YOU FOR SHARING YOUR “”BEAUTIFUL”” STORY, CONGRATULATIONS TO THE HAPPY PARENTS & ALL OF THE NEW ARRIVALS OTHER RELATIVES WHO ARE JUST AS ELATED TO HAVE SUCH A “”BEAUTIFUL”” ADDITION TO THE FAMILY. This made me so teary because there is so very much love in it! So happy for you! She is beautiful! Thank you for starting your precious birth story with us! Well, you were glowing, she is a veritable angel, and all the photos are amazing…Congrats!!! Many happy, healthy, blessed years!!!! 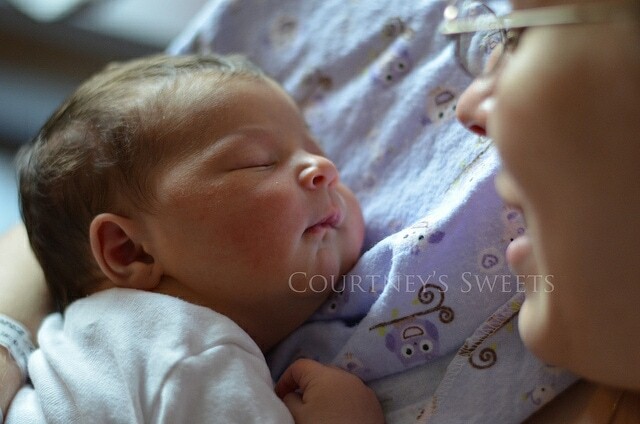 Oh, Courtney, your daughter is so beautiful and perfect! That last photo is so beautifully done. That picture of your grandfather with her makes me tear up every time I come back and see it. She is just SO beautiful!!! Stoppppp, I need to see her<3 pop pop looks so happy, you deserve this! What a wonderful story! Congrats on your daughter! LOVE the picture of your grandfather and your daughter. I could feel your love through your words. I felt the same way about my daughter. Well, I still do! Sadly, I got to watch her come into the world and feel all those wonderful feelings and then 11 years and 49 weeks later got to usher her out of this lifetime into whatever awaits us and feel all the feelings that come along with that. Enjoy every moment of your precious gift! You are blessed. What a beautiful story! 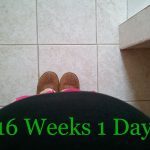 I’m a bit nervous about the whole labor and delivery process as I enter into my 3rd trimester with my first. Reading about these positive experiences and seeing the joy and love in all of your faces, reminds me it’s all worth it! You have a beautiful family!